Long time and regular listeners will know that when I first began this blog I conceived my personal list of ‘Ten things to celebrate about Swindon’. I’m actually not at all sure I ever got that list finished – so much is there here in Swindon that is blog worthy. As 205 posts and 26, 000 hits can testify. Anyway, in these earlier posts, one of my 10 things was/is the Swindon-born artist Ken White. And, as an actual son of Swindon (as opposed to being an adopted daughter like me 🙂 ), and an internationally known and acclaimed artist by everyone apart from the powers that be in Swindon it seems – his place on that list is eminently well-deserved. However, what I didn’t know then and have slowly learnt as Born again Swindonian has tottered along, is that this town is home to a whole Guggenheim of artistic talent of all types most – or at least much – of which is now happily represented on this blog. But there is still one really glaring omission to this ‘set’, now being rectified, and that is David Bent. It says much about the movers and shakers of Swindon, and sadly it’s not good, that I hadn’t – until earlier this year – heard of David and his work. Like I hadn’t heard of Ralph Bates, like it’s only relatively recently I heard about the Richard Jefferies museum and so on. You get the idea. It was only when ‘Katie-gate’ kicked off earlier this year that David and his work came onto my radar and I realised that he too should be featured on this blog. And that was only because David’s lovely wife Carole is involved with Better Swindon who, along with your very own blogger extraordinaire, was invited onto BBC Wiltshire to respond to Ms Hopkin’s verbal diarrhoea. So I guess we have something to thank her for eh? So anyway, life being as it is it’s taken until now for Carole and I to meet. I wasn’t able to get to their recent open studio weekend as I was busy gallivanting around London having breakfast at The Wolsley and dinner at The Savoy Grill – as you do. So Carole kindly invited me to their home to have a chat, meet David and look round the studio. David is known as an aviation artist but there is much more to his work than that as his website will tell you. His wife Carole has given me lots of really interesting information about David, his work and his support of, and contribution to, our less-than-perfect but much-loved Swindon – so the rest of this post will be taken from that. I mentioned above the Open Studios event – something that David has supported for the last ten years. One year there was just him and two other artists doing it to keep the event alive. ” His work is diverse – covering social issues , landscape geometry and more – but his niche interest in aviation is the strand that he is best known for”. 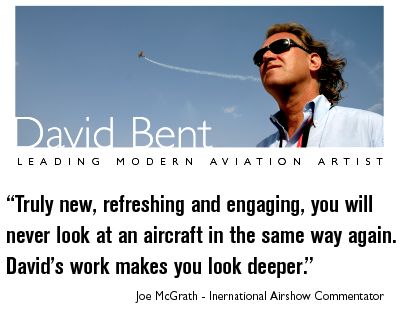 She goes on to say that: ‘Having first shown this work in a B&Q tent at the far edge of the airfield at Fairford, his work in the aviation sector has spread far and wide over the past decade & he is credited with leading a new movement in modern aviation art. (See artists bio in bentartgallery.co.uk for endorsements etc). Farnborough International , the Cotswolds VIP , the Dubai International Air Show & the Royal Tent @ the Al Ain Aerobatics Air Show , UAE. In 2012/ 2013 the RAF Museum hosted ” Fresh Air ” a year long retrospective of Dave’s work – the first of its kind for a living artist”. But even an internationally renowned painter likes to do other things. So while his relationship with the Red Arrows is well known an oft talked about it’s worth mentioning at this point that David gives significant support and commitment to the creativity of other people. This isn’t always easy to do when one is self-funded but both David and Carole believe in the importance of being part of the community and doing something for that community. To that end they are both member’s of PaRa the local resident’s association and actively take part in the spring and autumn clean. Laudable for sure. Indeed, I myself often go Wombling when I go to the shops at Freshbrook. The litter is disgraceful. Time to bring back the Keep Britain Tidy campaign surely?! “Children from Churchfields school were hosted by Dave for a tour of his Old Town studio & a private view of this exhibition. They enjoyed spending time with the Red Arrows who we had arranged for them to meet. In 2013, we attended an Art Auction at Churchfields school , buying childrens artworks in support of their creativity . Other children have also been involved in Dave’s work – 800 taking part in the Big Draw created their own artworks based on his exhibition at the Museum – their work was then displayed beneath the wings of a Mosquito. If you find yourself in the Xray dept of the Great Western Hospital – look out for two of Dave’s photo collages. A good surprise during his recent stay at the GWH was a visit by the Red Arrows team leader , Squadron leader Ruth Shackleton & PR Manager Andy Morton who wanted to check on his progress. So there you have it. HAD I known about David and his work he would most certainly have gone on my ‘Ten things to celebrate about Swindon’ list. But now at last his work is here, on Born again Swindonian, alongside all the other fantastic artist talent in this town. An adopted Son-of-Swindon for sure.